2018 Sport S Unlimited tires and wheels for sale. They are the Michelin ones. Includes all lugs and TPMS. Upgraded to new tires and wheels this week. Only 1k miles, brand new. Bought vehicle last month. Local pickup only. Best offer. I think they fit all wrangler unlimited models from 2008 and on. 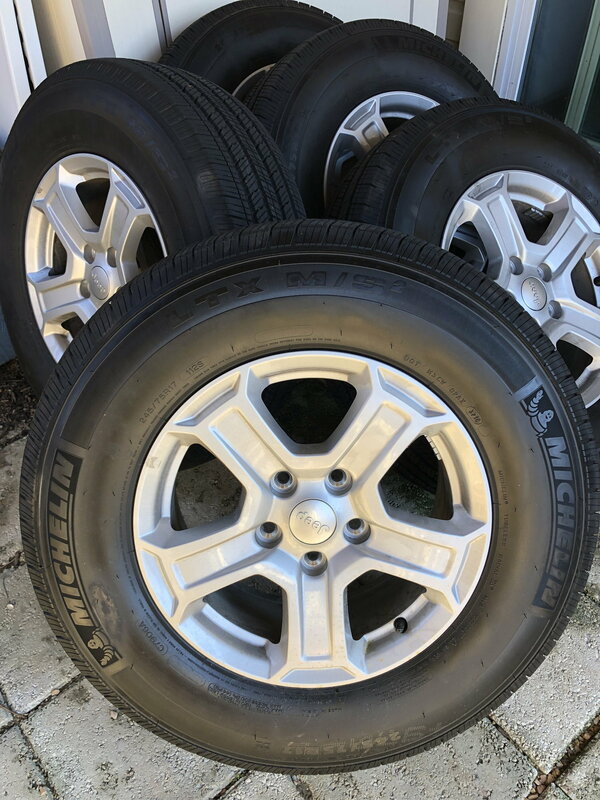 [QUOTE=Michael Rybczynski;4335880]2018 Sport S Unlimited tires and wheels for sale. They are the Michelin ones. Includes all lugs and TPMS. Upgraded to new tires and wheels this week. Only 1k miles, brand new. Bought vehicle last month. Local pickup only. Best offer. I think they fit all wrangler unlimited models from 2008 and on.